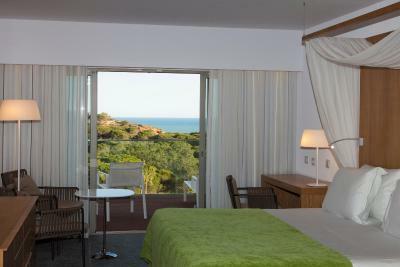 Lock in a great price for EPIC SANA Algarve Hotel – rated 9.3 by recent guests! Property was extremely beautiful, very well kept and clean. There were four pools so each day you had a choice of which one to use. Most of the staff were very courteous and helpful except for the front desk . A couple of them did not seem like they liked their jobs and were somewhat complacent with answers to our questions. It seemed like we were a bother to them when in fact our questions were quite simple to answer. Would give the majority of the staff a 5 star rating but the front desk a 4 rating! The breakfast buffer as ample with many choices, always freaks and full, wait staff very pleasant and attentive. The hotel and the landscaping are very beautiful. It has a very calming atmosphere. The staff are wonderful and very helpful planning trips and providing take away breakfast on our early morning departure day. Wonderful fitness classes and healthy choice of delicious foods. Beautiful walk to the beach or you can stay by the pool. Enjoyed the musicians for entertainment during meals and the trumpet player at the pool. Would definitely stay at this hotel again. We had a nice stay at this hotel. Great service and facilities and also the food was very tasty. It's a good choice for a family getaway. Our 8 year old daughter loved it! The property was beautiful. The rooms were modern with great amenities. The staff was delightful. I came here with my wife and infant child. Right away the staff was incredibly friendly and helpful. The faculty is even more beautiful than the pictures. Epic Sana is also incredibly child friendly. Would recommend this to everyone! Can’t say enough good things about this resort! This is a beautiful resort. The lobby, the bars and restaurants are modern and very interesting. Friendly staff and helpful. Very relaxing vacation. EVERYTHING! Such an amazing resort! highly recommended! The staff, food and the ambience are excellent. The beach area is real nice - good quality sand and an interesting walkway to the beach (in order to preserve the environment). The location is very good with access to nearby restaurants by foot and or short car ride. The pools are real clean well maintained and the open air restaurant by the pool is excellent. The hotel was very well kept both The rooms and the outside areas. The beach was amazing. EPIC SANA Algarve Hotel This rating is a reflection of how the property compares to the industry standard when it comes to price, facilities and services available. It's based on a self-evaluation by the property. Use this rating to help choose your stay! 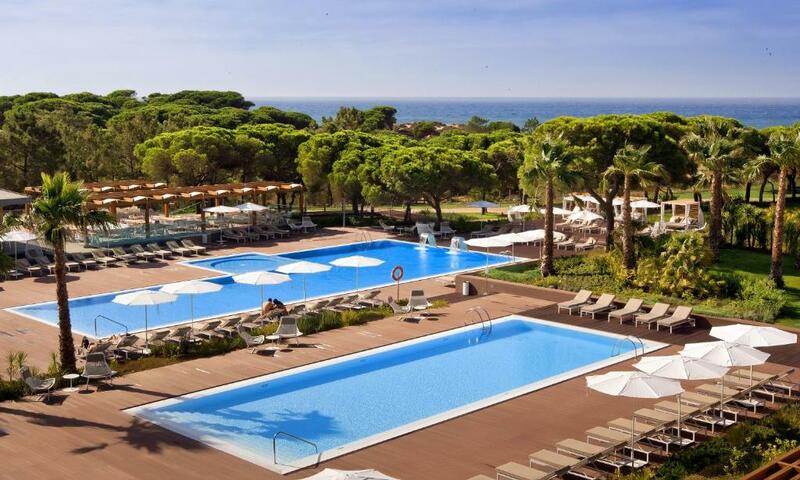 One of our top picks in Albufeira.Located between Vilamoura and Albufeira and overlooking Falésia Beach, EPIC SANA Algarve Hotel offers luxury accommodations set in a landscaped pinewood with direct access to the beach, an extensive spa and outdoor and indoor swimming pools. 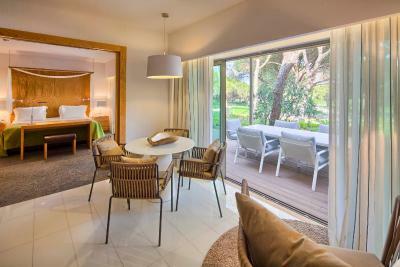 Rooms at EPIC SANA Algarve Hotel are generously sized and in a contemporary design, complemented by white marble bathrooms with rain showers and bathtubs. 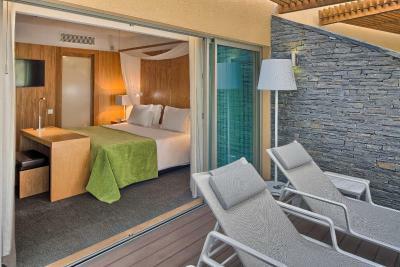 All rooms also offer balconies with partial ocean or resort views. Free WiFi access is available throughout the resort. 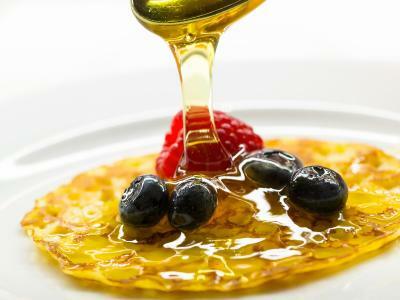 Breakfast and all-day dining is offered at the main restaurant, both indoor and al fresco. A poolside restaurant offers the opportunity of relaxing with a drink or a meal while enjoying the sun. In the evening, a gourmet restaurant and 2 bars are also available. Recreational facilities include a multi-sports court, a fitness center and an extensive spa. For families with children (ages from 4 to 12 years old), a seasonal kids’ club provides supervised activities and care, so that parents can take a break and relax for a while. 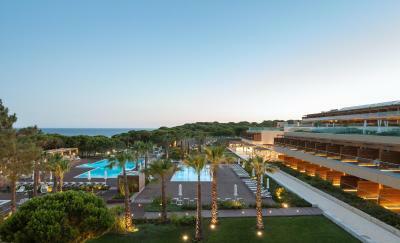 EPIC SANA Algarve Hotel features a congress center for business and social events. Faro International Airport is 19 mi away and Albufeira’s city center is a 15-minute drive away. Free on-site car parking is available. Oura Beach is a 10-minute drive away and the Pine Cliffs Golf Course is 0.6 mi away. 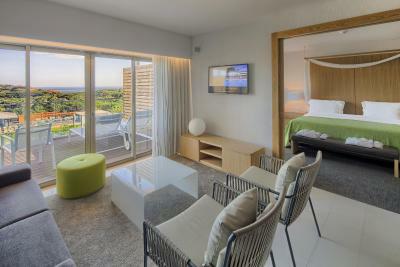 When would you like to stay at EPIC SANA Algarve Hotel? 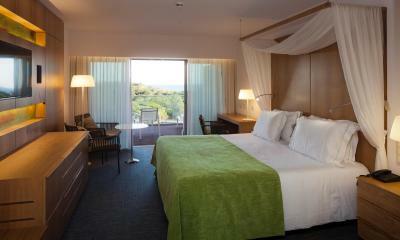 This large and elegant room overlooks the resort. This large and elegant room overlooks the pool. This large and elegant room overlooks the ocean. Overlooking the garden, this suite includes a living room and a furnished balcony. 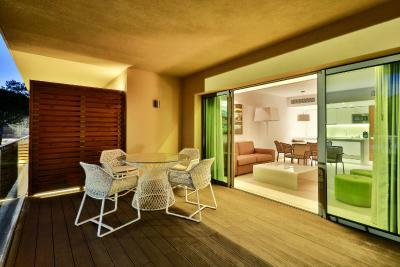 Offering pool or resort views, this junior suite includes a furnished balcony or terrace. The living area has a sofa bed which can accommodate up to 1 child. Offering resort views, this suite includes a furnished balcony or terrace. A sliding door divides the living room from the bedroom. The bedroom can include either a double bed or 2 single beds. The living room has a sofa bed which can accommodate up to 2 children. 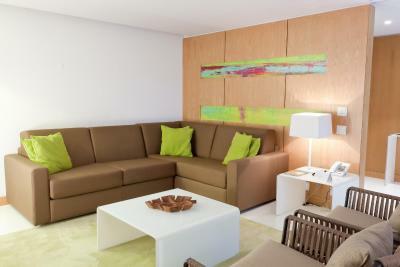 This family room accommodates 3 adults or 2 adults and 2 children. It is features a balcony, air conditioning and a mini-bar. This suite has a balcony, dishwasher and flat-screen TV. 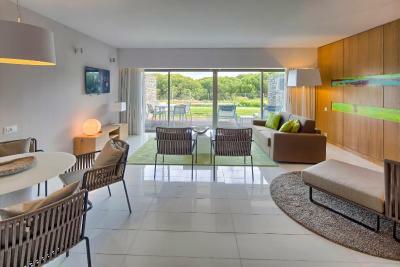 House Rules EPIC SANA Algarve Hotel takes special requests – add in the next step! EPIC SANA Algarve Hotel accepts these cards and reserves the right to temporarily hold an amount prior to arrival. Please note that the time of check in and check out of the apartments is different from the Hotel: check in is from 16.00 and check out is until 11:00. Please note that the Deluxe Double or Twin Room with Resort View, the Deluxe Double or Twin Room with Pool View and the Deluxe Double or Twin Room with Ocean View cannot accommodate any extra beds. 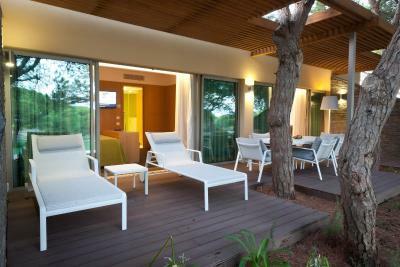 Stays between 16 July and 31 August – free cancellation up to 8 days prior to the arrival date (12:00, hotel local time). Cancelations within 7 or less days prior to the arrival date will be subject to a cancellation fee of 50% of the total stay reserved. Remaining periods of the year – free cancellation up to 72 hours prior to the arrival date (12:00, hotel local time). Cancelations within 72 hours of the arrival date will be subject to a cancellation fee equivalent to the first night reserved. No-show and early departures will be subject to a charge equivalent to 75% of the total stay reserved. Look & feel in whole facilities, maintenance, attention to us. Staff, food and location. 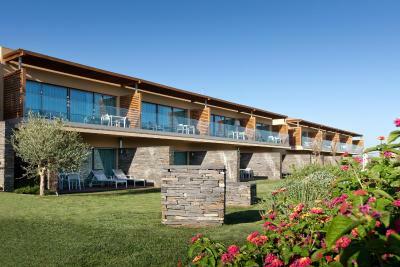 It is pretty new with a fantastic garden and entrance to the beautiful praia da falesia. Having read the very positive reviews on Booking.com that made me choose to book, I can honestly say that the EPIC Sana Algarve exceeded my expectations. Despite it being low season and not all the restaurants being open, the quality of the service, professionalism of staff, fabulous breakfast and dinner options on the Abyad restaurant were first class. The location on Praia de Falesia is stunning and I enjoyed being away from Vilamoura and Albufeira. I really appreciated the complimentary upgrade to a pool view room . 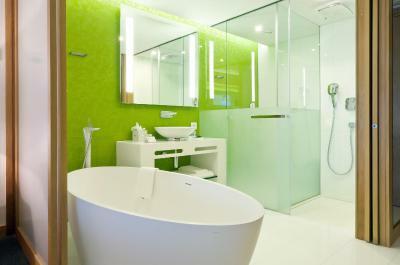 Very well appointed and comfortable and loved the freestanding bath. So entertainment during Off Peak season would be worth considering. We stayed with Epic Sana for four nights as part of our minimoon. Staff were very friendly and helpful from the moment we walked through the door. The Spa at Epic Sana was very enjoyable and the Sana Experience was very good value in my opinion. To further enhance the Spa I would love to see the relaxation room having view of the wonderful sea or garden views on this beautiful property. Overall, we had a lovely stay and would definitely return for a relaxing few days. - on two days they turned on the outdoor music at 6:30am in the morning. I'm sure this was by accident and the staff didn't notice, but it was quite annoying because (at least I) don't want to be woken up that early while on vacation. Breakfast was great. Rooms very nice. Friendly staff. Nice area. 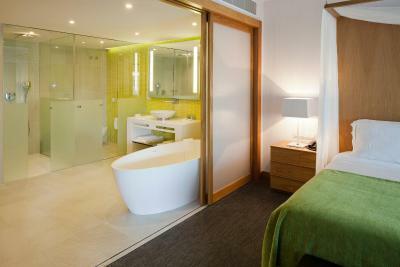 Nice bathtub in our room. Free yoga class Comfy beds Lovely big rooms Pool was great Our welcome was excellent!! Amazing staff, great service. They do whatever they can to make your stay comfortable. Everything perfect. Just fitting rooms in the indoor pool should be enlarged and better equiped. Indoor pool open 24 hours and kids aloud all day long. Nespresso coffe machnie in the room with capsules replenished daily. Kitchen in the room and ability to cook yourself. Fitness activities twice a day (pilates, yoga, circuit, running etc) The territory is fabulous and green. Very clean. Cozy rooms. Attentive staff. The main restaurant was closed which was disappointing. 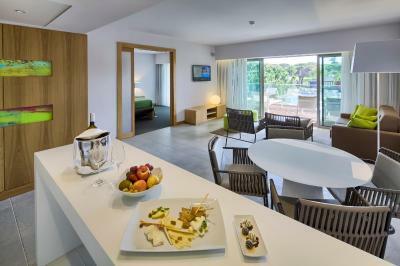 Epic Sana (again) met our expectations as the Algarve's premier resort.